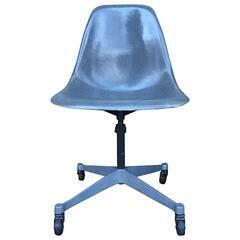 Kelly green fiberglass and vinyl Eames shell chair with rare back padded support on four point rolling office base. Similar to the PSCC chair. Chair is in good condition and the Kelly green color is vibrant and bright.